They have a variety of food that really suit my taste. I can have healthy options that are still nutritious. I don’t know, though, when they are going to be open. If you have the palate for authentic filipino/asian cuisine then you would not be disappointed. Their salad bar is well stocked as compared to several hotels. As far as price goes, it is well reasonable… ONLY – why are they closed? They’ve been closed since nearly 2 months already? What’s up with that, and are they going to re-open soon? 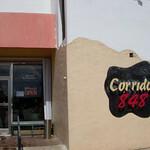 Any updates with Corridos 848? I missed eating in here.